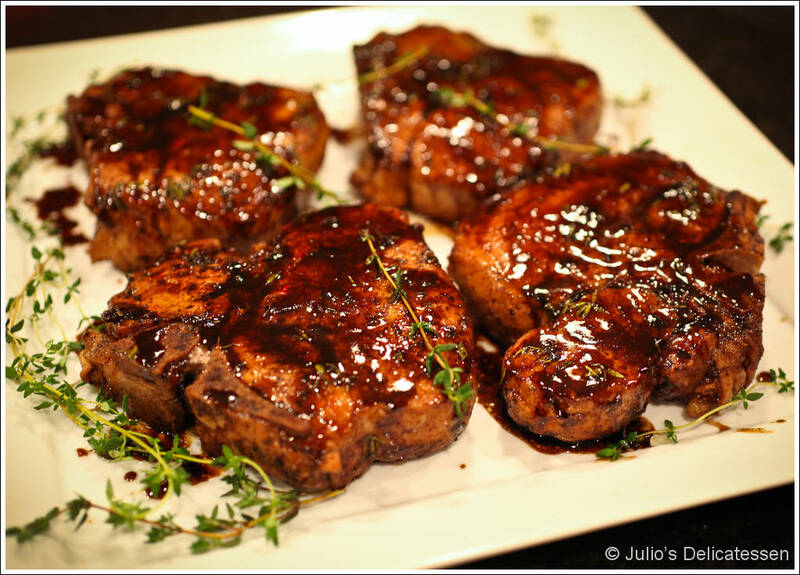 Agrodolce – essentially Italian sweet and sour sauce – is made by reducing balsamic vinegar and sugar (or, in this case, honey). You don’t have to brine the pork chops for this recipe to work, but you’ll be glad if you do. If you want to brine the pork chops (which I highly recommend), begin by making the brine, which can be done a day in advance or the morning you want to cook. Combine 2 cups of water, salt, sugar, peppercorns, garlic, and thyme, and bring to a boil. Simmer until the sugar and salt have dissolved. Remove from the heat and add 5 cups of water and/or ice cubes (which will help it cool more quickly). Once it is at room temperature, you can cover and refrigerate. When you are ready to begin brining the pork, submerge in the brine, cover, and refrigerate for 4 – 12 hours. 90 minutes before you want to eat – remove the pork from the brine, pat dry with paper towels, and place on a plate on the counter to allow to come to room temperature. 30 minutes before you want to eat – season the pork with some pepper. Heat some olive oil in a large skillet over medium-high heat. Add the pork and cook about 3 minutes per side, until lightly browned. Once both sides have browned, remove pork to a plate. 25 minutes before you want to eat – reduce heat to medium. Add the vinegar, honey, and thyme. Cook until reduced by half – about 5 minutes. Add the broth and bring to a simmer. 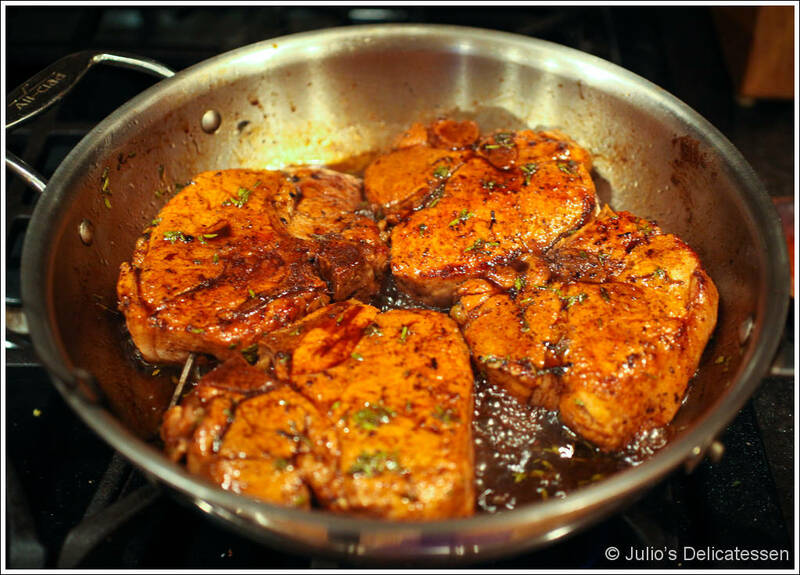 20 minutes before you want to eat – Return the pork chops to the skillet, cover, and continue cooking for another 4 minutes. Uncover, flip the chops, and continue cooking until the internal temperature reaches 145 degrees – about 10 more minutes. Remove the chops and allow to rest while you finish the sauce. Turn the heat up to medium high and simmer until the sauce is thick and syrupy. Remove the pan from the heat, stir in the butter, and serve with the chops. Thanks for this recipe! We’re having this for dinner tonite. I’ll let you know how it turns out.